Honeywell Captuvo SL42 - Sled for Apple iPhone 5, Standard Range Imager with Green LED Aimer, Standard Battery, Magnetic Stripe Reader (MSR), USB Cable, Documentation. Color: Black. Interface cables and charging cradles sold separately. Quad charging cradle base (Part# SL-CB-C-1). 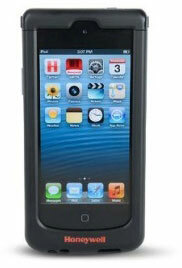 Honeywell Scanning and Mobility's Captuvo SL42 Sled enterprise enabled sled for the Apple iPhone 5G empowers mobile workers by enabling them to engage more closely with customers and increase conversions at the point of decision. Compatibility with the iPod touch provides businesses with access to over 500,000 apps on the Apple App Store, along with an integrated scanner and improved durability from a leader in barcode scanning technology. ChargeBase for Captuvo SL22 for iPod touch 5 & SL42 for iPhone 5 - US Kit. Four-bay sled charging cradle. Includes US power cord and power supply. The Honeywell SL42-032211-K is also known as HSM-SL42032211K	or SL42032211K	.